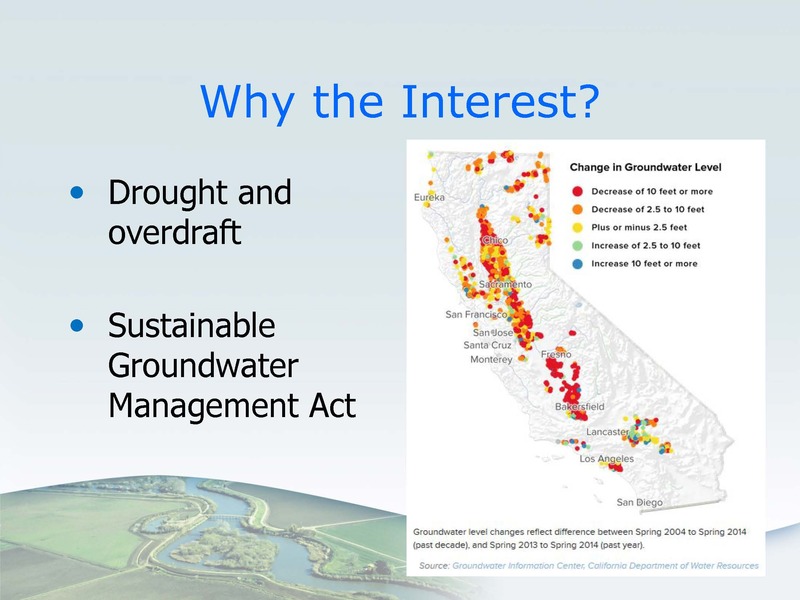 The ongoing statewide drought and implementation of the Sustainable Groundwater Management Act have triggered increased interest in capturing high surface water flows for the purpose of recharging groundwater basins. 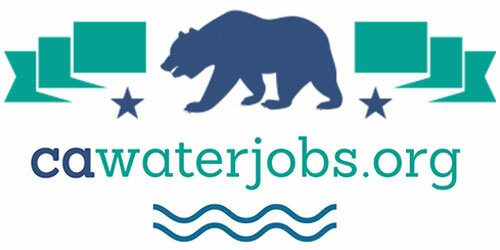 As part of the Executive Order Governor Brown issued in November 2015, the State Water Board was directed to expedite temporary permits for capturing high precipitation events for local storage or recharge, consistent with both water right priorities and with protection of fish and wildlife; the order also suspended CEQA for these types of projects. In water year 2015-16, two temporary permits were issued. At the December 6 meeting of the State Water Resources Control Board, staff provided an update on the program, which included presentations from the two projects implemented last year, and and some of the broad project-level questions that have come up in the process of issuing these temporary permits. Amanda Montgomery, Environmental Program Manager with the Division of Water Rights permitting and licensing program, began the presentation with some background information. California’s groundwater aquifers contribute more than 38% of the state’s water supply, and they are particularly important in times of drought. In many parts of the Central Valley, water levels in groundwater aquifers have dropped 10 feet or more in the past year. Many aquifers have become serious depleted; the Department of Water Resources as of January 2016 has listed 21 basins as critically overdrafted. 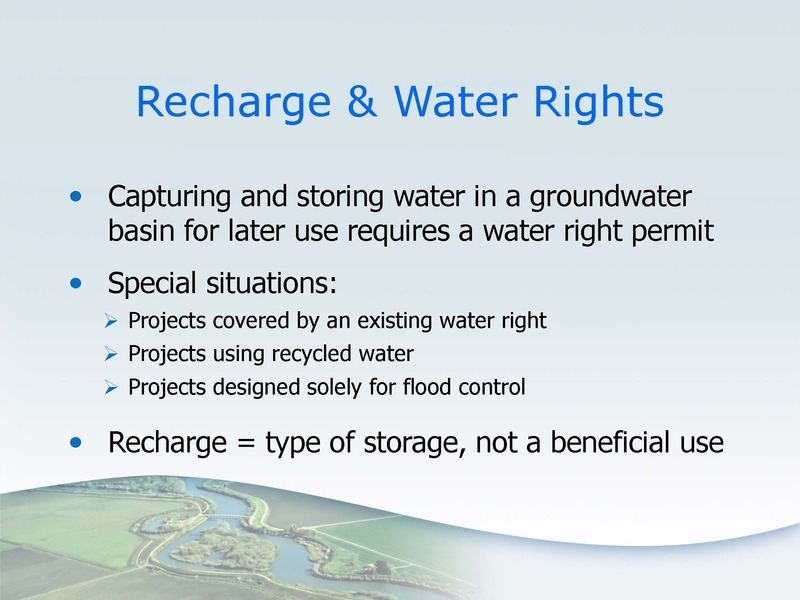 Artificial groundwater recharge projects are one method of addressing storage in these basins. In November of 2015, the Governor issued an executive order that, among other things, directed the State Water Board to expedite temporary permits for capturing high precipitation events for local storage or recharge, consistent with both water right priorities and with protection of fish and wildlife. The order also suspended CEQA for these types of projects; that will basically be in effect, we believe, until the drought state of emergency is terminated, she said. Additionally, in December of 2015 the State Water Board reduced the filing fees usually charged for these types of permits. 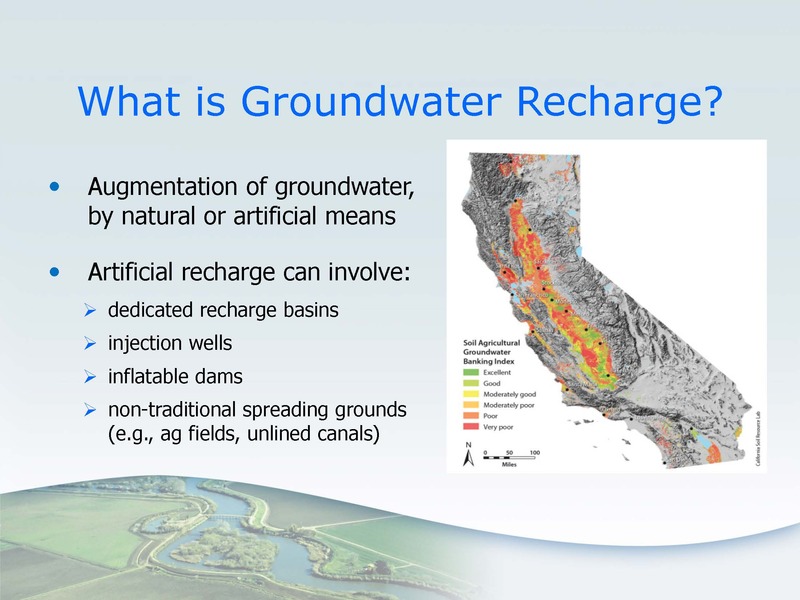 Groundwater recharge is the augmentation of groundwater, either naturally such as by rainfall, or artificially. This recharge can happen by diverting water to large recharge basins that infiltrates into the aquifer, by using injection wells, or by impounding water in a channel with an inflatable dam or a check dam or other approaches to increase infiltration. There are several options for obtaining the necessary water right. They could obtain a temporary permit or a standard traditional water rights permit. Depending on the type of water right, they may be able to use an existing water right. The Board has reduced fees for temporary permits for groundwater recharge and storage quite substantially, Ms. Montgomery noted. The fees can usually range from $2000 to $250,000, depending on the amount to be diverted, but the Board has basically reduced the application filing fee to just a couple of hundred dollars, depending on the amount to be diverted. These lower fees have been in effect since December 2015. Ms. Montgomery noted that in April of 2016, they held a staff workshop to solicit ideas from the public and parties that are involved in this issue; their recommendations and feedback is available in comment letters on our website, and they’ve looked through that and filtered that information back into their process. Staff also meets with parties that are interested in filing applications to talk through their projects and see how they can be made to work, she said. In the 2015-16 water year, there were two applications approved, one for the Yolo County Flood Control and Water Conservation District in Cache Creek, and the other for the Scott Valley Irrigation District in the Scott River. 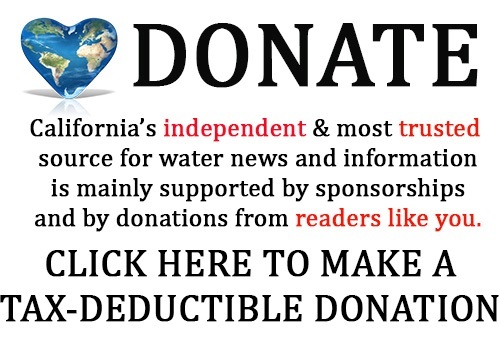 In this water year (at the time of the meeting, early December), three applications were filed; two were withdrawn after discussions with agency staff determined the projects needed to be redesigned, and one application, for Eastside Water District in the San Joaquin basin, was approved. The Eastside Water District project is located on Mustang Creek in Merced County, a tributary to the Merced River and the San Joaquin River and the Delta. The temporary permit authorizes Eastside to use an unlined existing flood control impound basin to divert up to 570 acre-feet of very high flows. They plan to use existing flood control structures at the existing flood flow levels, and they are going to do a number of actions to cause higher percolation rates in the basin. The project is to use water for irrigation; it is a situation where the District will have the permit, but the water will be used by many parties within their district, so individual well owners will be using the water. Ms. Montgomery then turned it over to the presentations from the two projects who had received permits in the last water year. Helen Dahlke and Dr. Thomas Harter gave a brief presentation on the project with the Scott Valley Irrigation District. Using agricultural fields to recharge groundwater aquifers with storm flows and flood flows has some advantages, such as the fields are usually connected to irrigation infrastructure that can be used to divert the water, and the ability to make use of larger acreages needed to spread available water. However, there are many factors to be considered, such as the crops that are in the fields that are being used for recharge. 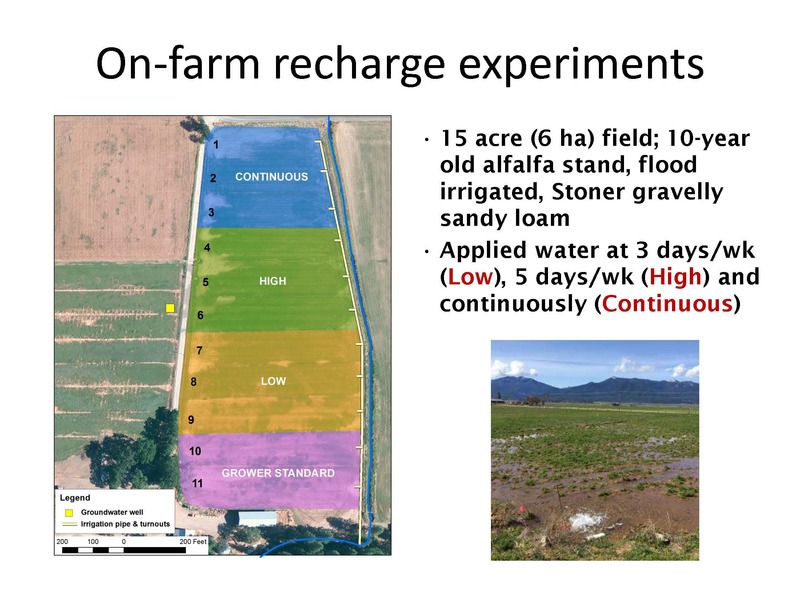 The Scott Valley is one of UC Davis’s experimental recharge sites; here the researchers evaluated using alfalfa as a cropping system for recharge. Alfalfa has the advantage of not requiring nitrogen fertilizers, so the risk of leaching nutrients into the groundwater is fairly low. The researchers were also interested in assessing benefits of recharge for instream flows. After the permit was received, there were 5 agricultural fields that received water diverted through the SVID infrastructure, as well as a surface pond with a leaky bottom which also contributed to recharge. They have been doing studies of the effect of water applied during the winter time on alfalfa yields by applying water at different amounts and comparing the yield to the standard plot that only received precipitation. They also measured how much was water was applied and how the groundwater table responded. 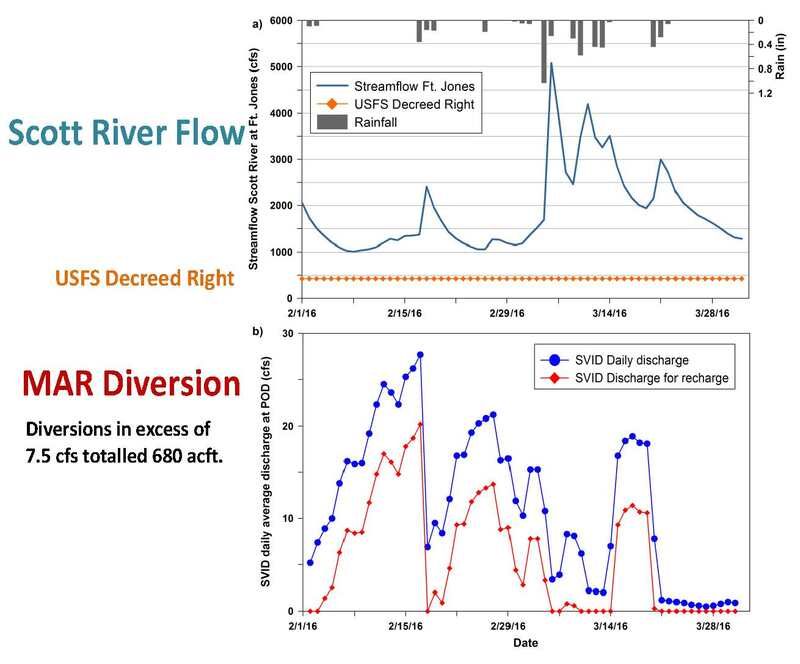 The water diversion was almost 6 cfs on average over a 2 month period; the Scott Valley River was never below 1000 cfs and at times exceeded 5000 cfs, so it was a relatively small amount diverted for the recharge process. Dr. Harter presented a slide showing the location of the fields, noting that they all are not too far from the Scott River. The color of the fields indicates recharge rate; the fields in green had about twice the rate of recharge as the two fields shown in pink. Dr. Harter used a groundwater-surface water model for answering the question of what ultimately happens to the water. The Scott Valley aquifer system is mix of sands, loams, and clays; it is not very deep. The groundwater model encompasses the entire Scott Valley; it also is coupled to a model that tracks stream flow. 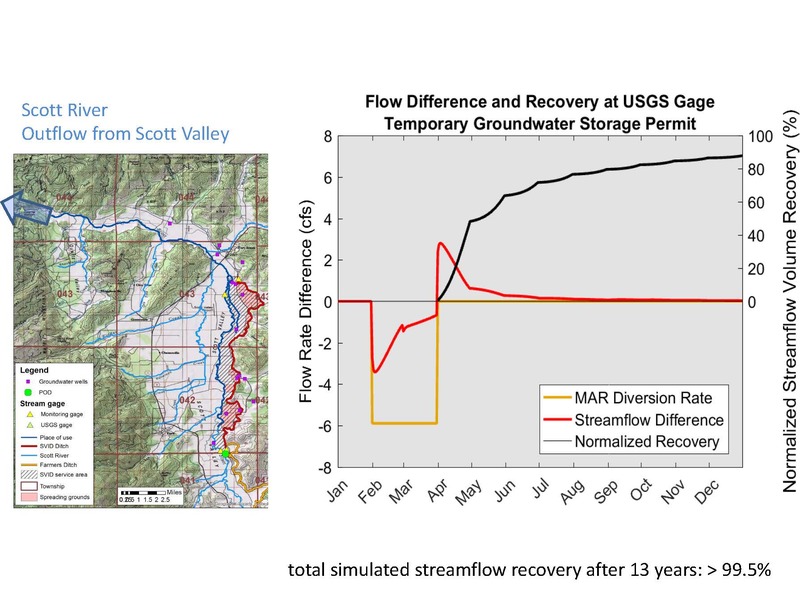 Dr. Harter explained that stream flow is included in the model; it is input at the edge of the valley where the tributaries and the Scott River flows into the valley, and then the model tracks the streamflow as it moves through the valley and interacts with the groundwater aquifer system. The model can then take also into account diversions, so when the water was diverted, it was taken out of the Scott River, and as a result, downstream from the Scott River, there was an ever so slight decrease in the stage of the river, so small it couldn’t be measured manually because it’s such a small fraction of the overall flow, but it could be tracked by the model. The model also tracked the amount recharged to groundwater, and then tracks where the groundwater will flow, consistent with our hydrogeologic understanding of the aquifer system. Dr. Harter then looked at what happens to streamflow at the bottom of the valley, noting that there is a stream gauging station in operation since the early 1940s at the point where the Scott River flows out of the valley into the Scott River Canyon. With the model, they were able to predict and analyze what happens to flow at that stream gauging station in response to taking 6 cfs of water at the diversion point; the model simulates the period from 1990 to 2011 and has been calibrated to that period. Tim O’Halloran, General Manager with the Yolo County Flood Control and Water Conservation District, then discussed the results of his agency’s project. 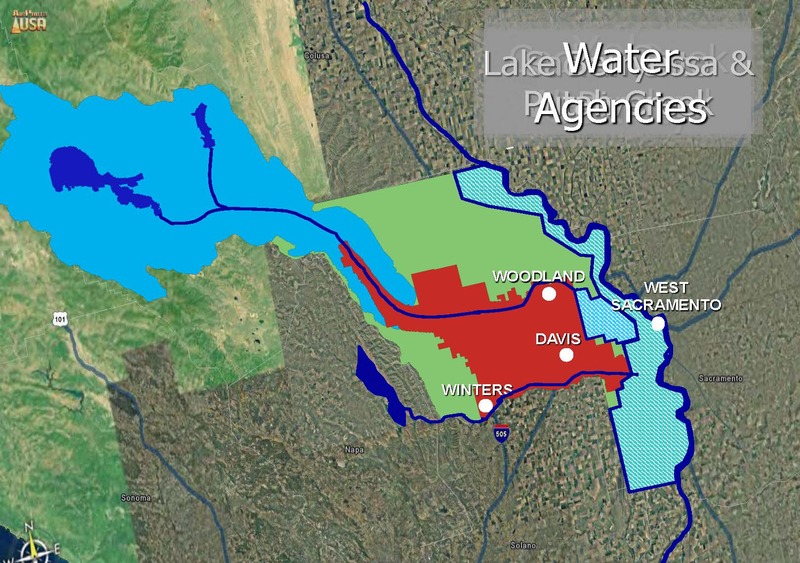 He started with a map of the area, noting that the Yolo County Flood Control and Water Conservation District service area is shown in red and the blue is the watershed. The Capay Diversion Dam is a 500-foot inflatable dam that is used during irrigation system for diversion, and that is the beginning of a 160-mile network of unlined canals. The District has been working towards modernizing the system to be able to accept high flows during the winter for recharging groundwater. They diverted water to be used for recharge from Cache Creek into their canal system. He showed another set of pictures where Cache Creek crosses Hwy 5 at Yolo, pointing out how much water is available there at times of storms. 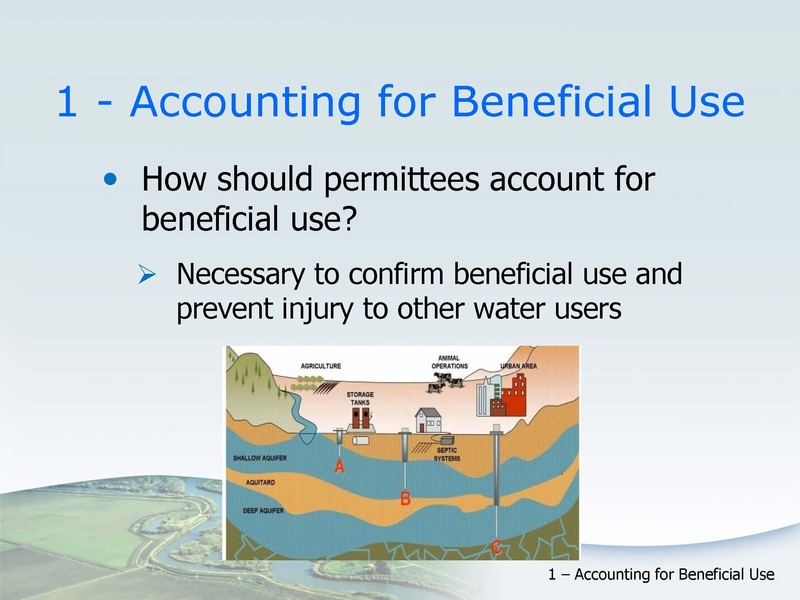 During the permit process, they agreed to measure water at certain points to ensure that there was always a minimum flow so that no downstream users, riparian or otherwise, would be injured. Another key part of the discussions was who was going to use the water, which would be the landowners in the district. They were able to provide this information due to their extensive monitoring network. Mr. O’Halloran noted that their unlined canals are part of a sensitive riparian habitat program that’s in place to provide natural habitat, so their unlined canals serve not only as delivery facilities but as recharge facilities and habitat facilities as well. The permit was obtained after two months of dialog with State Water Board staff, which is a short time for the State Water Board. “We worked together really well and accomplished this is a two month period to get this in place while respecting senior water rights and not damaging the environment, we notified all the downstream water users and got their buy in, and we also went to the DFW and talked to them about what consequences it might have, and they didn’t raise any issues at all,” Mr. O’Halloran said. Over 11,000 acre-feet was diverted between February 4th to April 15th . One of the big questions was determining what was a high flow, which is fundamental to the issue of when to divert high flows. Cache Creek is an ephemeral stream that’s dry nine months of the year. So after considerable discussion, they agreed to set a limit on how much they could take out and how much water had to continue down to Yolo, he said. It’s important to have a robust monitoring system, and to know the landscape and hydrology as each watershed is unique. Make outreach a component of the plan. “We talked to a lot of people as we were getting this going to make sure we weren’t stepping on any toes or violating anybody’s rights,” he said. With SGMA implementation, how are they going to accommodate new crops? “We think we have at least a partial solution to this, by diverting water that otherwise is lost to the system,” Mr. O’Halloran said. Sarah Sugar, an environmental scientist in the permitting and licensing section, then summarized the two projects. 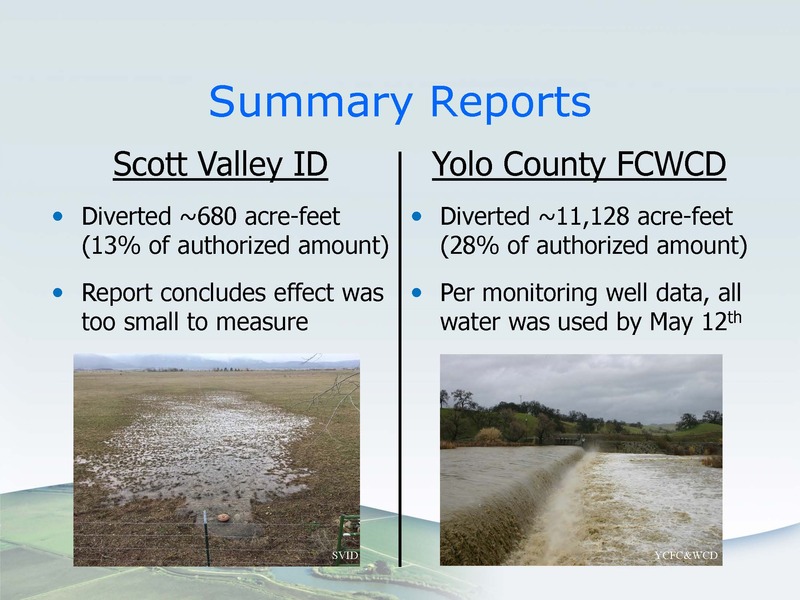 Both the Scott Valley Irrigation District and Yolo County Flood Control submitted summary reports in late September, early October as required in their temporary permits; the summary reports described how much water the permittees diverted, how much water was put to use, and how they measured or estimated beneficial use. The Scott Valley Irrigation District diverted around 680 acre-feet, or 13% of the maximum they were allowed to divert. The amount is smaller because the Scott Valley had above average rainfall last winter, and the delivery canal had already accommodated extra runoff and other legal winter diversions; that sometimes left limited capacity for diversions under the temporary permit. Also, some landowners were hesitant to add additional water for recharge when their fields were already soaked from precipitation events. The amount of additional water returning as base flow to the Scott River was too small to measure, so instead they relied on estimated numbers based on modeling data. According to the model output, some of the water returned while they were still diverting water; about 45 acre-feet of water returned between April and July, and approximately 90% of the water will have returned by the end of this year. 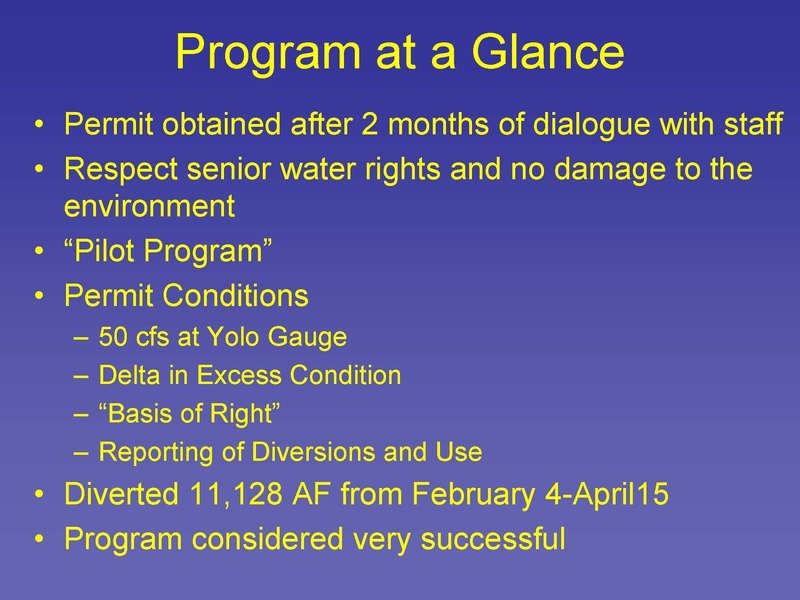 Yolo County Flood Control and Water Conservation District diverted approximately 11,128 acre-feet or 28% of what they were allowed to divert. They were allowed to use agricultural lands but they ended up only using their unlined canal systems for this project. Diversions were sometimes limited because of runoff in the canals, water turbidity, permit conditions, and storm forecasts. Based in 11 monitoring wells in Yolo County Flood Control’s district, more than 13,000 acre-feet of water, or more than they diverted, had been withdrawn in the district’s service area by May 12th, and they calculated this using the average drop in water table levels over their service area. While processing the applications for these projects, there were some questions that came up for how to process and structure permits for groundwater recharge. Sarah Sugar and Darren Tran then ran through the questions. Question #1: How should permittees account for beneficial use? Water appropriations are linked to some beneficial end use, like irrigation or municipal use; when the beneficial use of the water ceases, the right ceases. Accurate accounting and reporting helps ensure water isn’t wasted and that the diversion doesn’t injure other legal users; but for underground storage, this accounting isn’t always straightforward, Ms. Sugar said. She noted that the figure here gives an idea of a few of the different influences on inflows and outflows in groundwater basins, such as pumping in different locations at different depths, and connections to surface flows. Beneficial use for some types of projects can’t be directly measured. Ms. Sugar noted that a good example is Scott Valley Irrigation District’s case where the objective of the project was to increase flow in the Scott River by raising the water table near the channel. 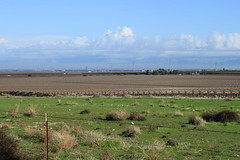 The two projects used two different methods of accounting for beneficial use: the Scott Valley Irrigation District used their integrated groundwater surface water model, and the Yolo County Flood Control assumed no losses and relied on water level data from their network of monitoring wells, estimating the amount of water put to use by measuring the local drop in the water table. 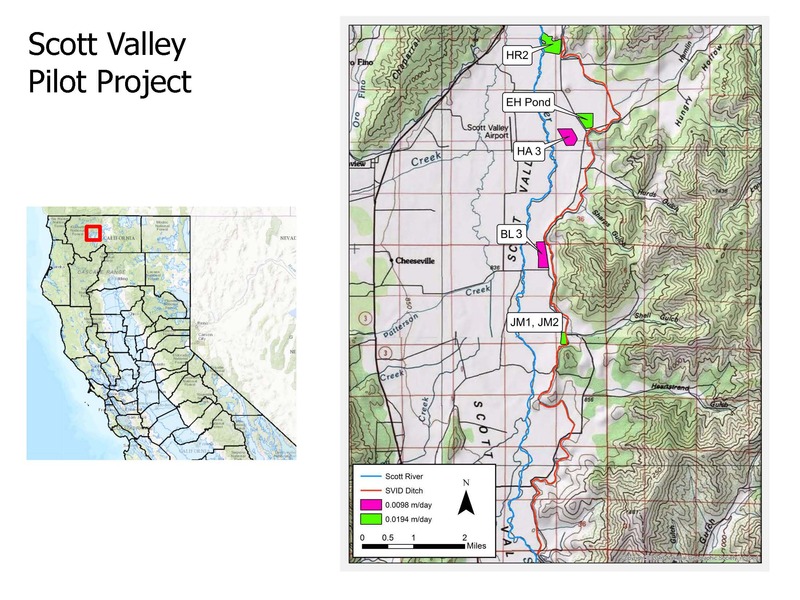 There were no plans for long-term storage or increased pumping for the Yolo project. 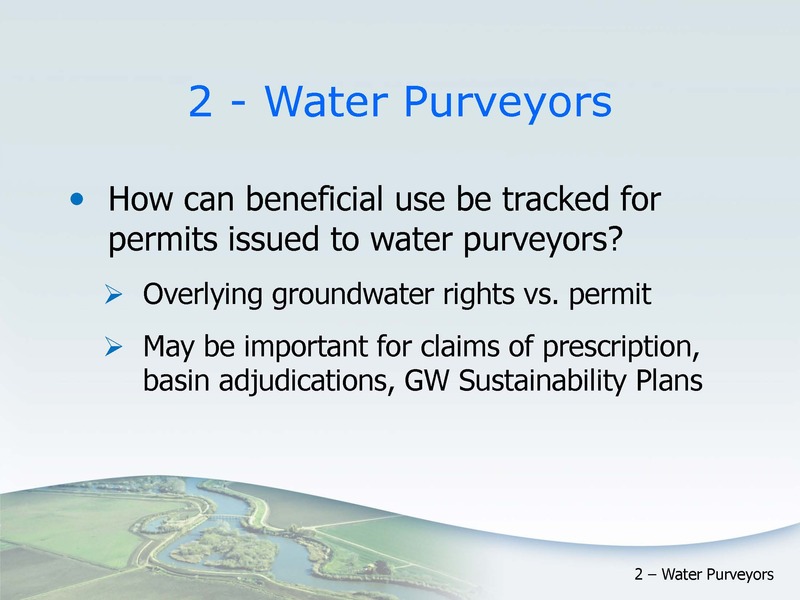 Question #2: How can beneficial use be tracked for permits issued to water purveyors? Another question that arose is when the parties submitting an application is not the party that will actually be using the water. This was the case for Yolo County Flood Control’s project, as well as Eastside Water District. The districts were the permittees, but the users were private well owners within the district’s service areas. The Yolo County Flood Control and Water Conservation District addressed this by passing a resolution allowing their customers to use water stored underground under the permit; the Division decided this solution was acceptable for the particular project because the permit was temporary, the water would be used quickly, and the users were already surface water customers of the district. 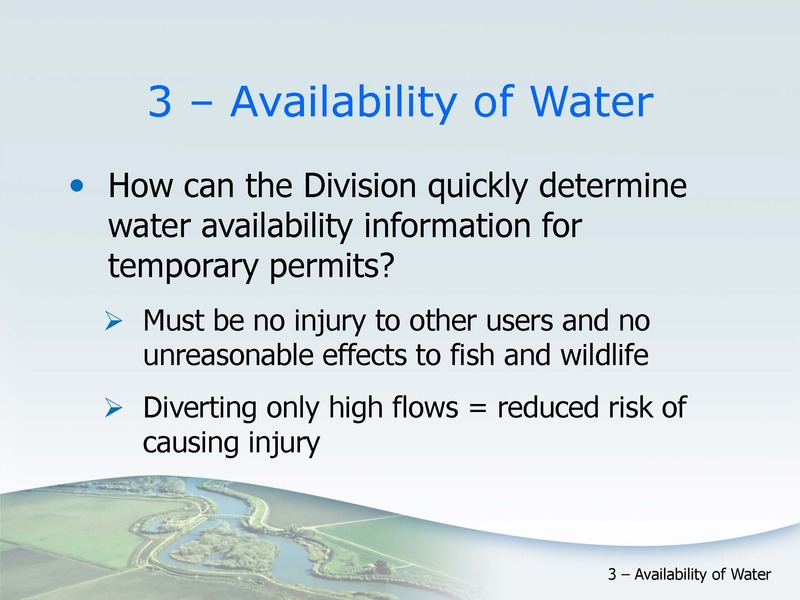 Question #3: How can the Division quickly determine water availability information for temporary permits? The objective of determining availability of water for temporary permits is to make findings that there is no injury to other legal users of water, and no unreasonable effects on fish and wildlife. These findings also apply to a standard permit; however, under a standard permit, it is a requirement that the applicants must demonstrate that an appropriate water is available to supply the project. Under the temporary permit, it is not a requirement, but staff would need to review available records and any information that relates to the availability of water before approval. He said they would continue to prioritize projects consistent with the Governor’s order; once the order is lifted, the Division will prioritize permits using our existing prioritization criteria. The Division gives priority to projects that are of statewide significance and to projects designed to minimize or avoid impacts to the environment, he noted. 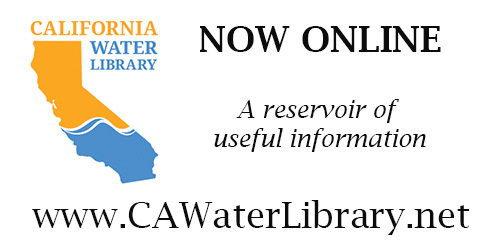 Click here for the State Water Resources Control Board’s webpage on groundwater recharge permits. Click here to watch this presentation on webcast. 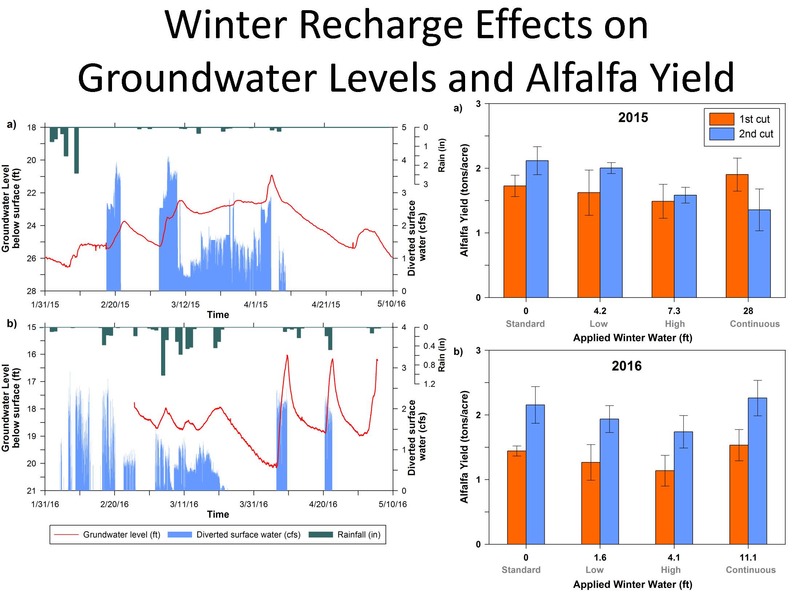 Something I find fascinating is the SWRCB approval of recharging aquifers through flooding of Alfalfa fields. Alfalfa is a Legume… it concentrates atmospheric nitrogen into the soil profile. The SWRCB has been spending millions of tax payer money to regulate(aka limit) nitrogen leaching into ground water. Perhaps I a missing something here but this sounds counter productive to the nitrate management laws that are being implemented.